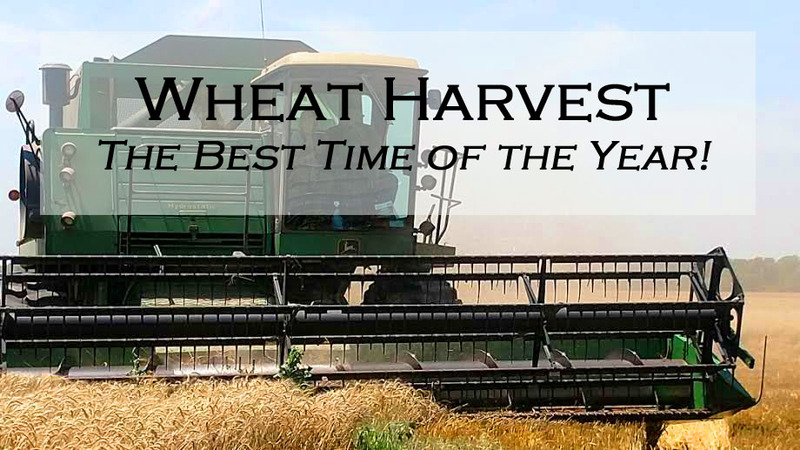 Wheat Harvest - The Best Time of the Year! 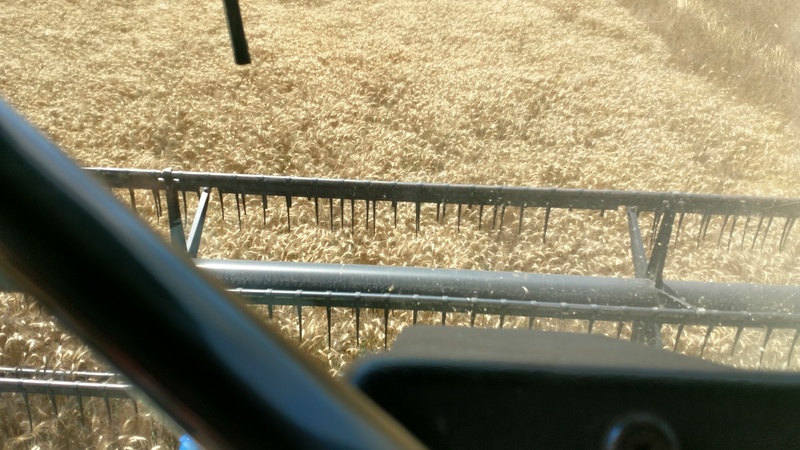 Wheat Harvest – The Best Time of the Year! We are smack in the middle of wheat harvest right now! (Update: We finished last night before our area got a big storm!) Hip-hip-hooray! Seriously, I think wheat harvest is the absolute best time of the year and I feel so sorry for everyone that doesn’t get to experience it! This was my view most of this week! 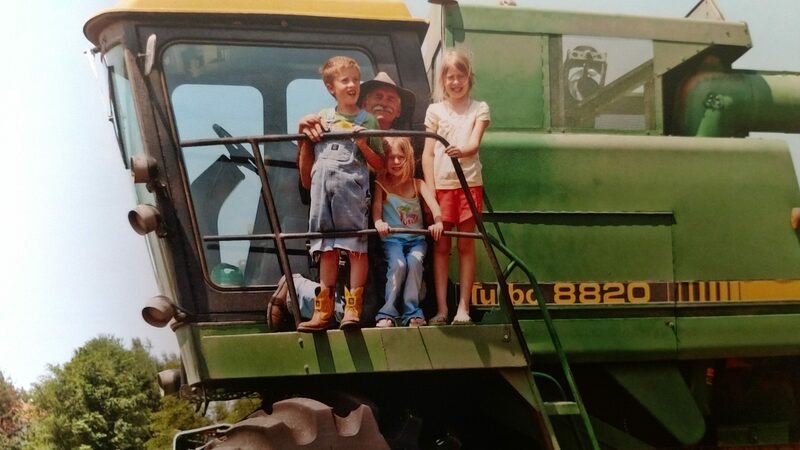 Here are my kids with their grandpa. This was about 7 years ago! Everyone was so little! As a kid, harvest was like another holiday! We all looked forward to it and we’d fight to get the first combine ride. We had two main elevators that we hauled to- one handed out glass bottles of pop (later switching to aluminum cans) and the other handed out bubble gum. You could find us kids somewhere in the field or on the road to the elevator during harvest. 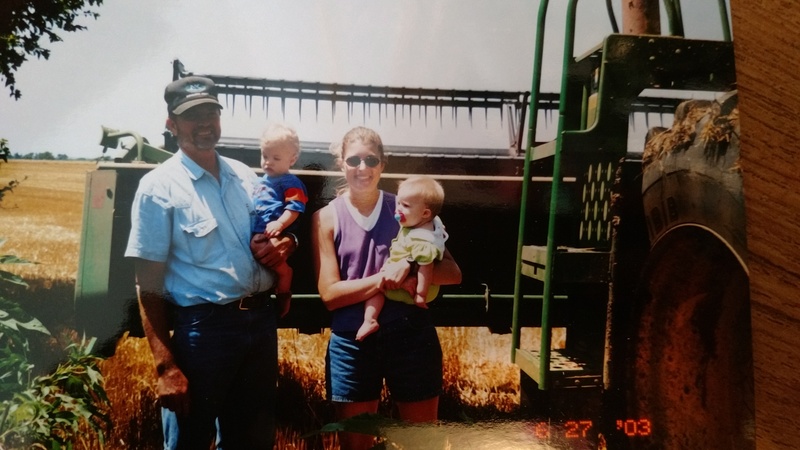 Mom pretty much let us go where we wanted and if we wanted to come home, then we had to hitch a ride from our uncle or grandpa (if we were hauling the wheat back to the bins at our house) or wait until supper when Mom brought food to the field. I have so many harvest memories! 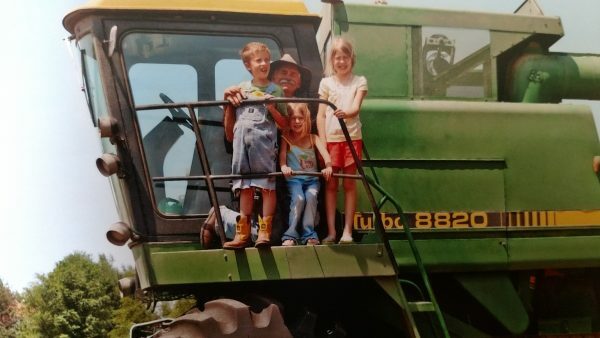 We would play in the grain in the back of a wheat truck, take naps in the combine, try to chew the wheat long enough to make gum (you had to chew for like an hour! ), eat our share of raw wheat and come home dirty and scratched up from the wheat stubble! It was hot, it was windy, it was dusty and it was so awesome! As I got older and became a teenager, my role changed. 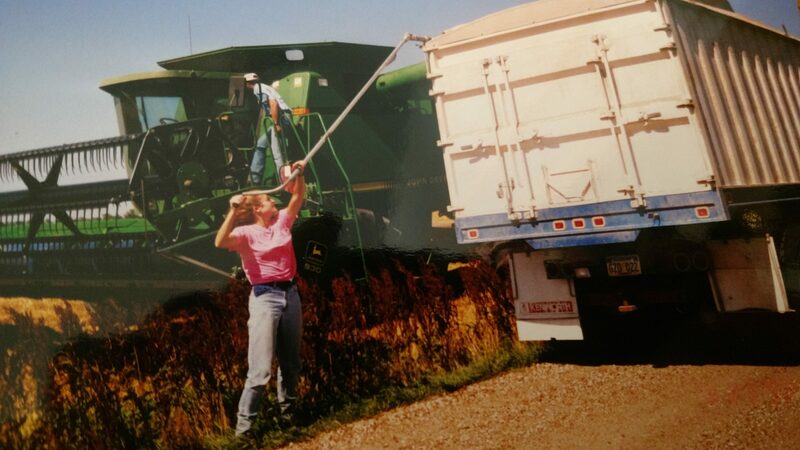 I still had a blast in the field, but I eventually graduated to truck driver and occasional combine driver. We had converted semis (instead of pulling a trailer like you normally see with semis, my dad and uncle elongated the frame and put a grain bed on it). The trucks all had quirks, which you learned very well after hours and hours of driving them 🙂 They also did not have air conditioning and there was no radio. This is me tarping a truck before taking it to the elevator. 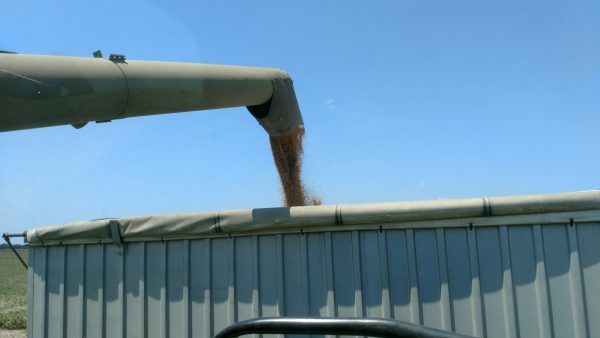 This is my view out the back window of the combine. That’s the auger dumping wheat into the combine bin. When my window gets covered, I know the bin is full and it’s time to dump in a truck. One year, after driving trucks for a few days, they decided to put me in the tractor and have me start planting the double crop soybeans. I was basically running behind the combine. An afternoon thunderstorm popped up and everyone scrambled to get the equipment home. My sister was riding with me and we were in the far end of the field (it happened to be one of the biggest fields we had!). I was told to just keep planting until the rain came, so my sister and I are out there just planting away, watching the storm come closer and closer…. and then on the radio, they break in with a tornado warning! A tornado had been spotted only a couple miles from our field and was headed our way! 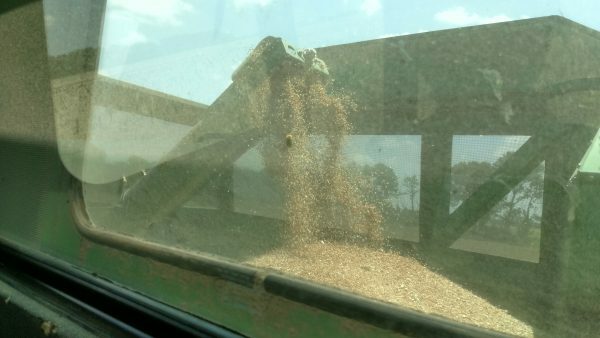 This is the combine dumping into our semi. This is the view from the combine seat. That long thing is called the auger. It folds up for when you are out in the field. My kids love wheat harvest as much as a I do. Everybody get their first combine rides as babies. 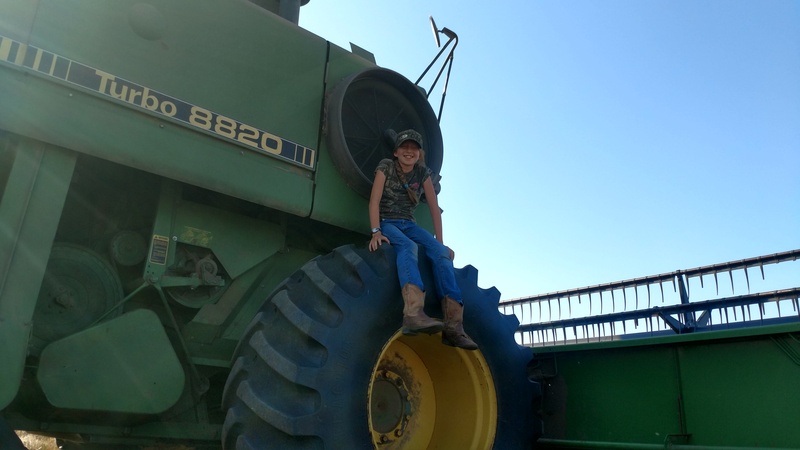 My 10 year old niece got her first combine ride just a couple days ago… she thought it was extremely boring and she can’t figure out what all the hype is about. Maybe you have to grow up with it? You catch the excitement of the adults and it just stays with you? During wheat harvest these days, my job is to run the combine occasionally, which I LOVE. Yesterday, I started teaching Lindy (who is 11 years old) how to run it, so one day she can help. (Update: After 3 days of operating it for several hours each day, she’s a pro and is about ready to solo!) 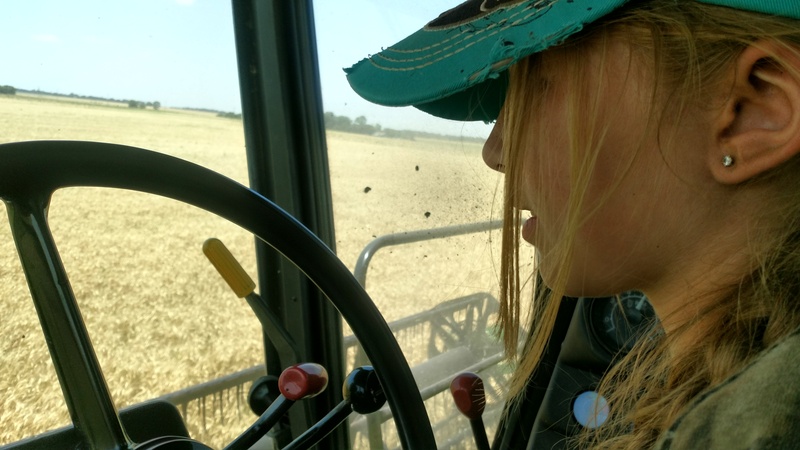 That’s one thing about farmkids- you start learning to drive large equipment, which would intimidate most adults, very early in life! 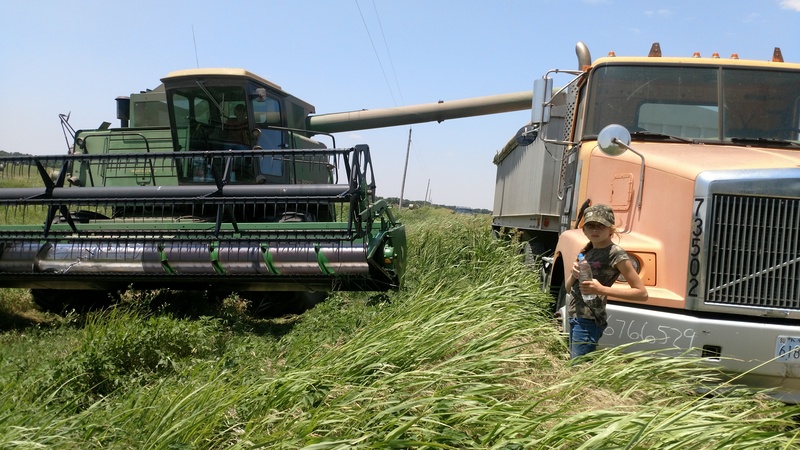 Once wheat harvest is over, it’s almost a let down. On one hand, you’re relieved that the crop is in the bin (this means money for the farmer! ), but after the adrenaline rush that keeps you going for a week or more, you kind of feel a crash and it’s rather sad that all of the excitement is over. Lindy’s taking a short break while the guys change the fuel filter in the combine. Have you ever experienced a harvest season? Does anyone else have a yearly “thing” that happens that you consider an unofficial holiday?